The GV-Control Center is integrated security management software that provides a handy tool to maintain central monitoring station. GV-Control Center is a comprehensive solution for central operators to efficiently control GV-System (GV-DVR/NVR), GV-VMS, GV-Recording Server and I/O devices. 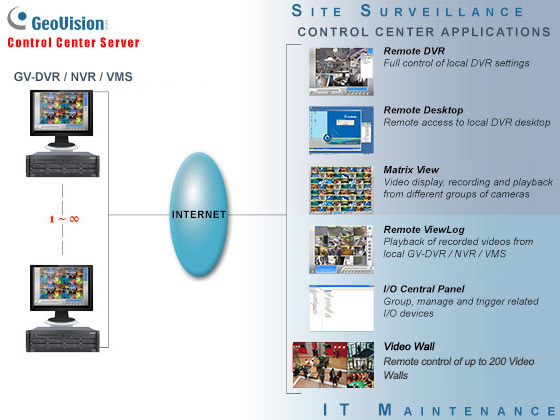 With GV-Control Center, multiple GeoVision surveillance and video management systems can be managed and maintained efficiently to enhance their monitoring performance and ensure smooth operation. The Control Center's features and capabilities include the followings. The Remote DVR facilitates the administrator to remotely configure local GV-System’s specific settings from one single workstation. When the Remote DVR is on the run, the local GV-System loses its full control of the DVR operations and the Control Center takes full control of the configuration. When the Remote Desktop is on the run, the Control Center will receive the same desktop view of local DVR. In the meantime, the security administrator can remotely control the local GV-System's full operations and even configure Windows operation system of the networked GV-System at low bandwidth. The Matrix View is a single display where videos from a group of maximum 96 cameras will be displayed, e.g. groups of office area cameras, exit cameras, or street cameras. The GV-Control Center supports up to 8 Matrix View displays with 768 cameras on 8 monitors at a time. Depending on various surveillance needs, the center operator can open 8 Matrix View displays simultaneously to view more videos from different DVRs / NVRs. Each Matrix View supports live monitoring, recording and video playback. The Remote ViewLog function enables playback of all video archives from different GV-Systems. The security administrator can utilize this Remote ViewLog to save video clips for future event retrieval or for video evidence. The Control Center provides a useful I/O Central Panel for the security administrator to remotely manage all I/O devices connected with GV-Systems. Administrators can group function-related I/O devices together for ease of control, e.g. groups of IR sensors, alarms, or fire exits. In case of building fire, for example, the Control Center can trigger all alarms on the networked GV-Systems and force opening all the fire exits or water spray systems at the same time. Authentication Center is an account and access rights management system that provides centralized control over multiple GV-Control Centers. The hosts in the Authentication Center can be grouped by different locations and purposes. Administrators can configure each user account to have specific access rights for every group. When a GV-Control Center is connected through the Authentication Center, the users are able to see the hosts for the group(s) in the Group List they have been granted access to. A video wall is an establishment of multiple monitors on a server. In this setup, the number of monitors allowed depends on the capability of the server's graphic card. With the Video Wall function of Control Center, you can create layout, Zoom Window and Scan Window. The Control Center can manage up to 200 video walls. *One host supports up to 9 sets of 16-in and 16-out I/O modules. 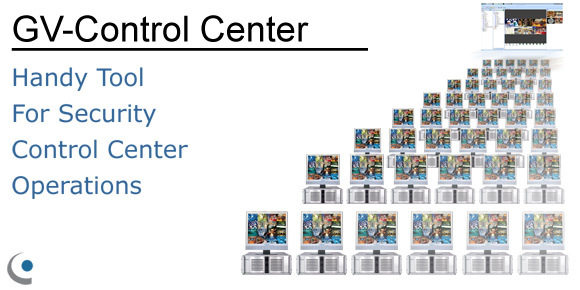 The maximum number of hosts allowed depends on the performance of Control Center server. For the GV-Control Center to support up to 8 Matrix views with 768 cameras at a time, the minimum CPU and memory requirements are Core i7-3770 and 16 GB dual channels respectively. 1. We do not recommend installing GV-Center V2 (Pro) and GV-Control Center modules on the same PC. Running GV-Center V2 (Pro) and GV-Control Center on the same PC may result in CPU overload error or system failure. 2. To display a megapixel IP channel across monitors, make sure the external graphic cards on a server are of the same brand, model and driver version, and the capacity of graphic cards are of NVIDIA GTS 450 or higher to ensure maximum efficiency. 3. When you find CPU usage is high or live view is unsmooth (dropping frames), you may need to increase the CPU thread and memory or decrease the number of connected cameras to improve the system performance. 4. For the GV-Control Center to support up to 8 Matrix views with 768 cameras at a time, the minimum CPU and memory requirements are Core i7-3770 and 16 GB dual channels respectively. 1. For the Video Wall function, make sure you insert a GV-USB dongle with Video Wall function to Control Center server. 3. The Maximum License is a paid service. 1. This specification does not apply to GV-Video Wall. 2. If you have both on-board VGA and external VGA installed, the on-board VGA must be connected to a monitor for H.264 / H.265 GPU decoding. 3. You can install multiple external graphics cards if needed. 4. CUDA compute capability 5.0 or higher is required to ensure optimal performance.